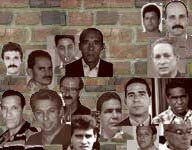 I write about Cuban political prisoners from afar, almost more about what they represent than who they are as human beings. Blame it on the distance, physical and otherwise, between Florida and Cuba; my struggles with the Spanish language — how can you capture what is really happening in Cuba if you can't command the language; and the fact that I really don't know the journalists, human rights activists and other dissidents imprisoned because of their opposition to tyranny. Reinaldo Escobar knows those in the Castro gulag because of their faith in freedom. They are his colleagues. They are his friends. They are his brothers. One shouldn’t wait for it to be the commemorative date of the Black Spring of 2003 to address the topic, but what can’t happen is that March 18th and 19th pass and one remains quiet, knowing that over these last long six years, 75 Cubans remain in prison for the sole crime of making public their disagreement with the government. When I speak of one, I am talking about myself and everyone who has even the most remote possibility of doing something to promote the freedom of these people. When I speak of 75 prisoners I include among them those who are physically behind bars and those who were the “beneficiaries” of parole for health reasons. Is it the case that Raúl Rivero and Manuel Vázquez Portal are not still imprisoned? Are you going to tell me that Héctor Palacios and Oscar Espinosa were released, pardoned, given amnesty, acquitted or anything like that? I feel sorry for my country, I feel tremendous shame to have to confess to you that I live in a nation where a person like Adolfo Fernández Sainz shares a cell with common criminals, where Pedro Argüelles went through a dungeon of punishment for refusing to wear the uniform of a prisoner, where Pablo Pacheco, like almost all of them, has ceased to be a healthy person. It is not journalistic bias, against writing a long list of names, that keeps me from mentioning them all. I speak only of those I know, of whom it makes me proud to be their friends. Each day that adds to the completion of these sentences is an insult to so many things, to what is right, to our history, to our country. How can I play with my granddaughter, drink a beer, or go to the beach when I am a self-confessed accomplice to the same crimes that they committed? If it were true that Cuba is heading toward fundamental changes, the first test would have to be the immediate release of all Cubans imprisoned for political reasons and here this figure rises to approximately two hundred people. If political disagreement is not decriminalized, the rest of the changes are worth nothing. It would be immoral to applaud the abolition of the dual monetary system, the disappearance of the unnecessary rationing system, the lowering of all prices and the raising of all wages if in return for this we had to accept imprisonment of the nonconforming. I can’t conclude this commentary without mentioning the name of the one solely responsible for this situation. His name is Fidel Castro Ruz. Only when he gives the order or when he is definitively incapacitated and cannot keep someone else from giving it, will my friends leave prison. As I am not in a position to insist that he free them, I use this insignificant space to ask him, with total humility, to use his telephone to call his younger brother or the Minister of the Interior and call for the release of those he himself incarcerated. I am proud of my efforts on behalf of Cuban political prisoners, and have no plans to stop anytime soon. But I also know I will never feel Reinaldo Escobar's pain. A footnote: Escobar is married to the Yoani Sanchez, the best-known blogger in Cuba.